The Fidelity Convertible Securities Fund (FCVSX) seeks a high level of total return by investing in convertible and preferred securities. The total return is achieved through a combination of income (the current yield is 2.16%) and capital appreciation. 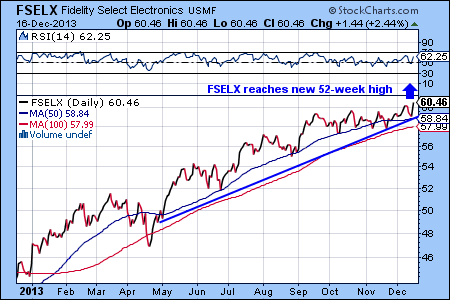 The chart shows that FCVSX underperformed the broader market from February to mid May. Our expectation is that renewed interest in convertible securities will help FCVSX to resume its uptrend and that FCVSX will prove to be a solid investment in the coming months. 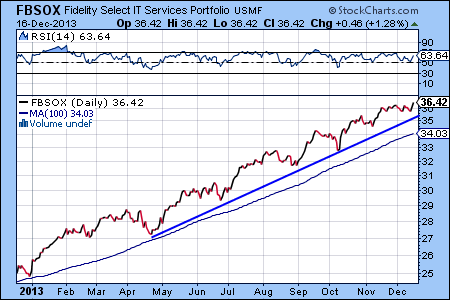 The question about the tapering of the Fed’s QE3 program dominated the markets today. The S&P 500 index managed a modest gain of 0.63% and closed at 1786.54. The Fidelity Select Electronics Fund (FSELX) was the best-performing Fidelity mutual fund today (source: www.fidelitysignal.com/market_indicators). FSELX top holdings include large cap technology companies, such as Intel, Broadcom, Qualcomm and Micron. FSELX reached a new 52-week high today and we would not be surprised to see it become one of the top funds in the next market cycle. The other two tech funds we’d like to highlight are the Fidelity Select Software and Computer Fund (FSCSX) and the Fidelity Select IT Services Portfolio Fund (FBSOX). 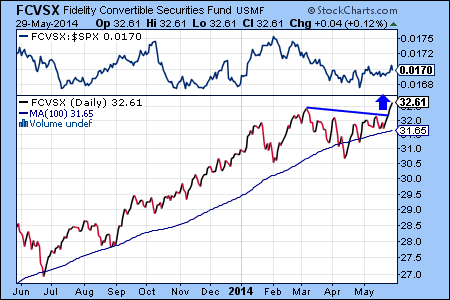 Both funds continue to show an almost uninterrupted bullish trend since the April market correction. The Fidelity Contrafund (FCNTX) is a highly popular equity fund with a large-cap bias. Although large cap stocks did sell off Friday, the unproportionally large 6.69% drop in the net asset value (price) of FCNTX alarmed some investors. The explanation for the large price drop is that Fidelity distributed both dividends and capital gains for a number of their funds with a pay date of Monday, December 16. The sell-off for equities was broad based today, which is not surprising in light of the almost uninterrupted advance since the October correction. One troubling sign, however, is that defensive sectors are impacted as much, or even more so, than the more aggressive growth sectors. 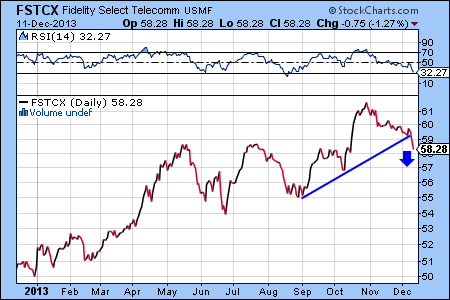 For example, telecom and energy utilities are regarded as conservative investments, because they can provide dividend income and stable returns. 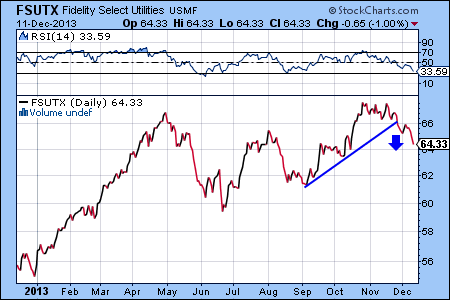 The two charts below show that the corresponding Fidelity Telecommunications and the Utilities Funds rolled over and entered into a declining phase. On Friday, several Fidelity funds experienced large drops of their net asset values (NAVs). 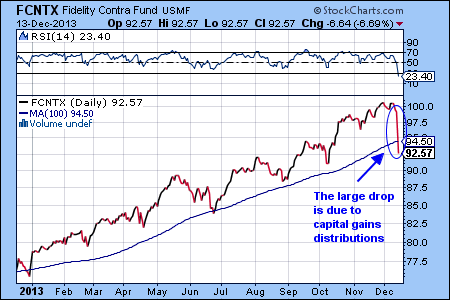 For example, the Fidelity Magellan fund showed a 5.57% drop. Other examples include the Latin America Fund (down 17.79%), the China Region Fund (down 9.2%) and the Select Technology Fund (down 6%). The explanation is that Friday was the ex. date for the distributions of many Fidelity funds. The pay date for the funds is on Monday, December 9. For investors who chose to reinvest the distributions automatically, the value of their holdings will be adjusted on Monday. 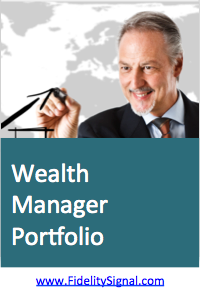 For investors who chose not to reinvest, their investment account will be credited by the distribution amounts. The biotech sector was one of the hardest hit in the stock market sell-off today. However, the one-year chart of the Fidelity Select Biotechnology Fund (FBIOX) shows that the bull market is still intact. The chart also shows that corrections are normal, but to confirm the bullish trend, we would like to see FBIOX making a new high again in the next few weeks. 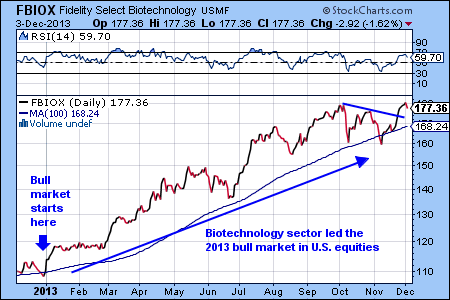 The reason for the importance of the biotechnology trend is that this sector has led the bull market of 2013. FBIOX turned out to be an excellent way to invest in the biotech sector, just as in past bull markets (e.g. 1999 and 2003). And just as in the past, market leading sectors (and the corresponding Fidelity mutual funds) making higher highs and higher lows were required to propel the broad market indexes higher.